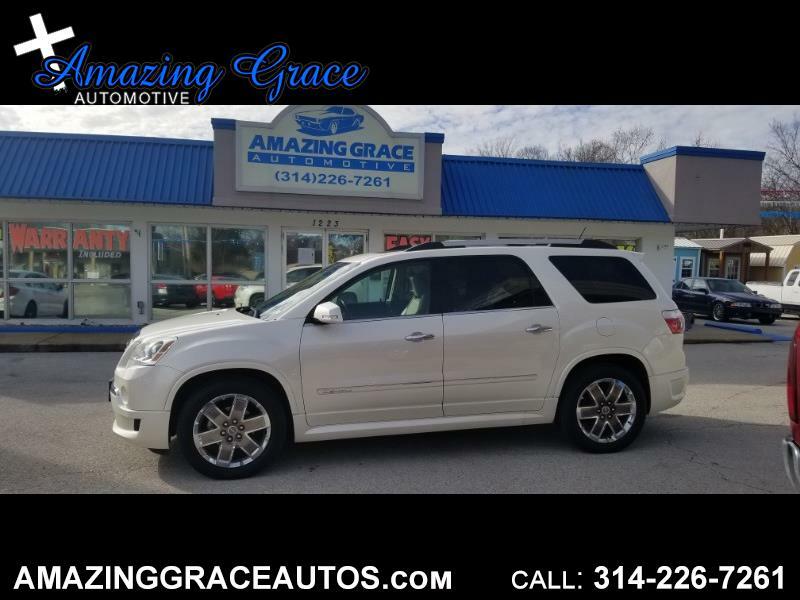 This is a beautiful 2011 GMC Acadia Denali AWD that is absolutely loaded! It is a local 2 owner Acadia with no accidents! This Acadia is absolutely in great condition! You will love driving your new Acadia every day! Plenty of room for the entire family with seating for up to 7 passengers! Navigation and DVD Entertainment System! This Acadia is powered by a strong and fuel efficient 3.6L V6 that is paired with a smooth shifting automatic transmission with overdrive! You will love having an All Wheel Drive this Winter! Tons of great features including a Power Moon Roof, With a second Sky Light over the second row, Leather Seats, Heated Seats, Cooled Seats, Memory Seats, Power Seats, Second Row Captains Chairs, Premium Alloy Wheels, Power Liftgate, Technology Package, Heads Up Display, Bluetooth Wireless, Stabilitrak, 4 Wheel ABS Brakes, Traction Control, Anti-Theft System, Tilt and Telescoping Steering Wheel, Rear AC, Premium Bose Sound System, Remote Start, Keyless Entry, Navigation, DVD Entertainment System, XM Satellite Radio, Front and Side Airbags, Back Up Camera, HID Headlamps, Roof Rack, Tow Pkg, Side Curtain Airbags, Rear Parking Sensors, AM/FM/CD/MP3, and so much more! We include a 12 MONTH 15000 MILE POWER TRAIN WARRANTY INCLUDED AT THIS PRICE!!! ONE LESS THING TO WORRY ABOUT, YOU'RE COVERED Please call Rick at 314-226-7261 and you can always visit our website at www.amazinggraceautos.com to view our entire inventory. If you would like to GET PRE-APPROVED click on the finance tab! We have great options for financing for all credit types! Warranties are available up to 48 months! We are located just 20 minutes from South County down Hwy 55. This is a used car lot! TRADES WELCOME!!! Website: www.amazinggraceautos.com Address: 1223 N. Truman Blvd Crystal City MO 63019 Phone: (314) 226-7261 ? Rates as low as 3.39% With Approved Credit -NO PROBLEM ? Credit Union financing! -NO PROBLEM!! ? Good Credit , Bad Credit, No Credit OK--NO PROBLEM Call or Text anytime to set up an appointment! Every Car on the lot comes with MO State Safety and Emissions with a 30 Day temp tag Free of Charge!!! ? Also 12 MONTH or 15000 Mile Power Train Warranty on all Qualifying Units, Also Extended ?Warranties can Be Purchased at Any Time..... The Internet Price is the Cash Price only, Does Not Include Tax, Title and Fees!